and a lot of elbow grease. Parking in Whangarei TownBasin Marina’s affordably priced docks are a mere $540/month NZD (>$375 USD). Then again, parking at Whangarei’s pile moorings are $265/month NZD (>$200 USD). We’re cheap, and more used to paying nothing to anchor out. 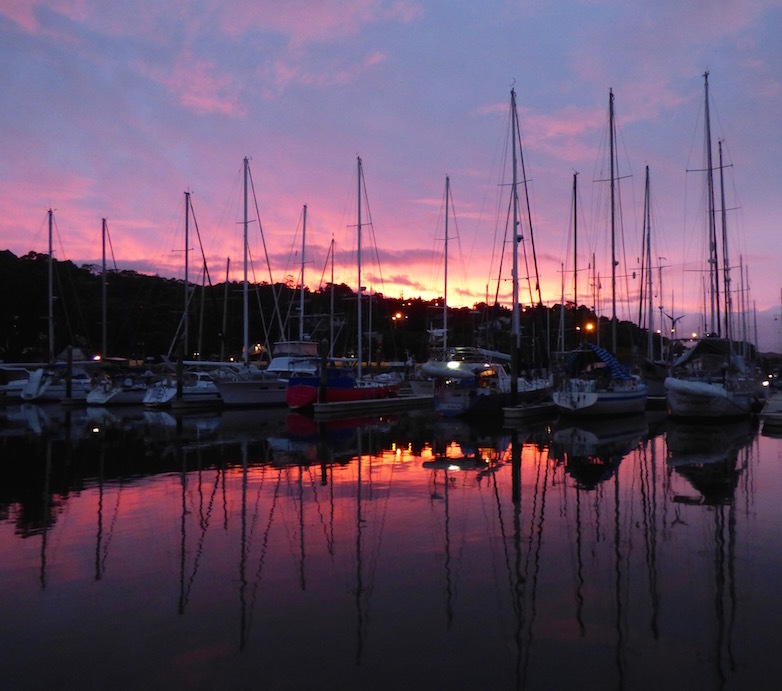 Opting for the exceptional convenience of the town basin marina, we went with the pile moorings. (appropriated) “Huck Finn” raft from the dock side. 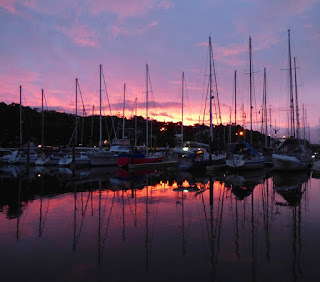 The inconvenience of pile moorings is you can’t get directly to the town basin from the boat. 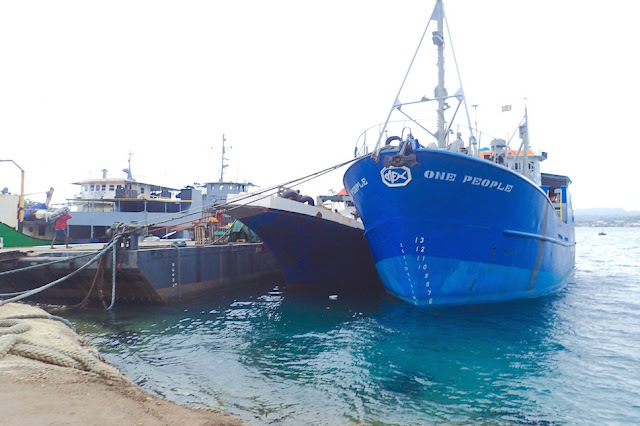 You’re close, but whereas on a dock, you merely step off the boat and you’re on you’re way to Whangarei. On the pile moorings, you are tantalizingly close, but as beaming over exists only on StarTrek, getting there requires a dinghy to cross the water. 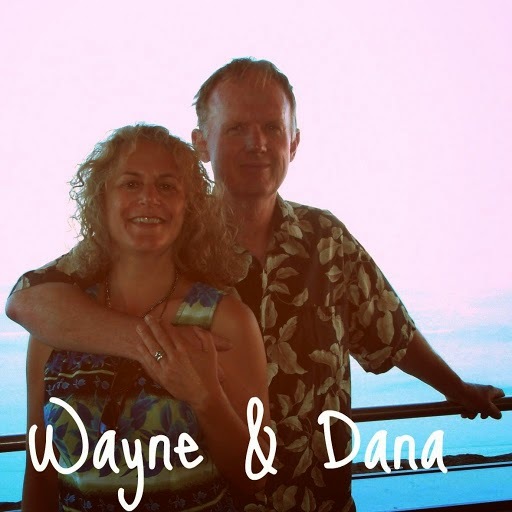 Gutsy move – Wayne launches off with oomph! After spending several hours in nearby Whangarei Riverside Marina’s Boat Yard using hydrochloric acid to clean our dinghy’s bottom from our last stay on Town Basin’s pole moorings, I wasn’t looking forward to déjà vu. Granted, if we hoisted our dinghy quickly after each dip, it wouldn’t get as bad as before. 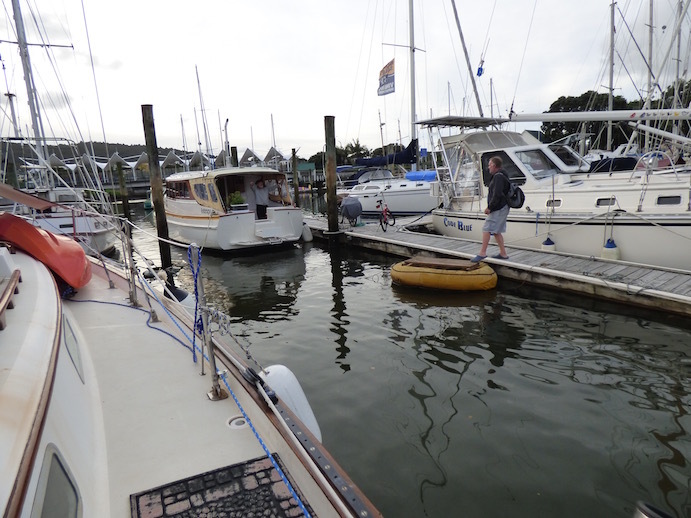 This time, our new pole mooring was just one boat away from the docks -- only about 15 feet (or about 4 meters). Soooo close…. In between, just about 5 feet away, was a motor boat, with a nice big swim step and an easy step from that to the dock. between our boat and the dock. Then, behold! 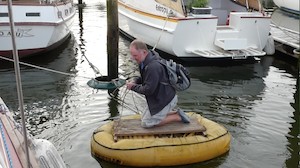 Miraculously, we noticed some clever and blessedly absent adjacent pole moored cruiser created a makeshift solution. 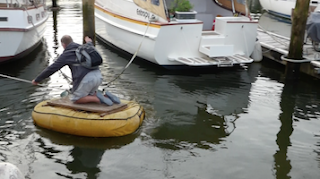 They added a wooden grate and some strings to a tatty upside-down inflatable dinghy. A floating bridge! We decided to beg forgiveness rather than ask permission. A little push off the raft, and glide to the side of the motor boat, and hand-over-hand our way to their swim step. A couple steps from there and onto the dock! Whoo-hoo! Then the motor boat left, leaving a BIG gap. Uh oh. A simple push and grab would no longer cut it. Almost there! 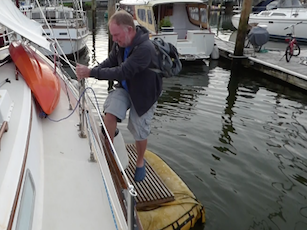 Wayne grabs our boat’s bowline to the pole mooring. We experimented, adding additional, longer lines, and the long-armed assistance of our boat hook. We worked on our launch-and-glide technique, balancing our desire to cross without sliming our dinghy, to basic cowardice and a strong aversion to any kind of in-between splashdown. If nothing else, we’re providing regular yacht-er-tainment, aka yacht tv for our neighbors and passerby. “Ummm, you do know that thing’s upside down, don’t you?” deadpanned a crusty dockside lookee-loo. “Gonna make it? 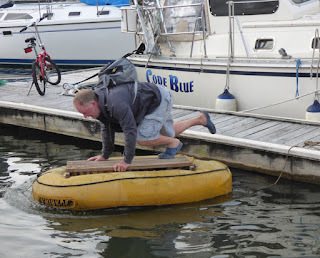 Need help?” asked Steve, concerned yet helpful, from dockside neighboring sailboat Code Blue. Wayne steps safely aboard onto our home sweet boat. That a Pearson 365 sailboat in our case. “Aren’t you two brave enough to cross on that together?” chuckled neighboring cruiser Charlie of Entropy. After my muttered retort about not wanting risk falling into the friggin’ cesspool also known as the Hatea River marina area, he added “Oh, I can understand if you just took a shower.” Cruisers know better than most that not only fish do it in the water, and the greater the concentration of boats, the more “do it” there likely is in the tea-colored water. 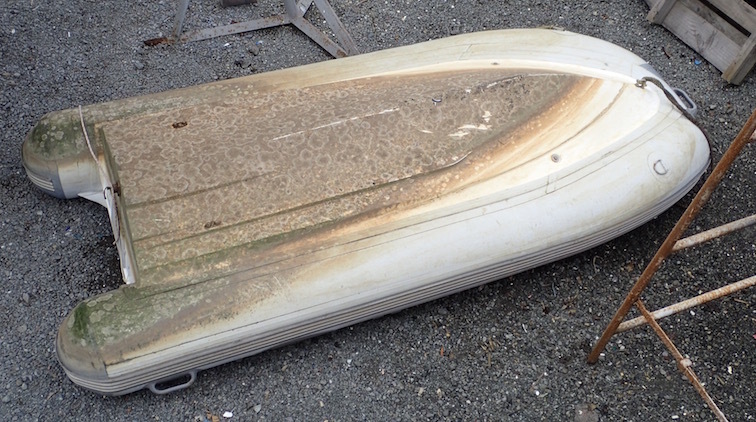 Thus far, with only one exception, we’ve been able to keep our dinghy clean and hoisted. We’ve even, when it’s made sense to do so, managed, gingerly to cross together without incident, though given that the lines we use to cross drape into the opaque muddy-brown Hatea River, Wayne and I both thoroughly wash our hands after each crossing. Eat your heart out, Huck Finn (click here if you're not sure who Huck Finn is)! Hmmm, why didn’t I remember take his cue when I was painting our hull?!? is worth its weight in gold. Location LocationWe're back on a pole mooring in Whangarei’s Town Basin Marina (S35.43.412 E174.19.539). Last year, between December 2014 and November 2015 we sailed from Florida USA to New Zealand, over 10,000 miles (visiting USA, Cuba, Colombia, Panama, Galapagos [Ecuador], French Polynesia, Cook Islands, American Samoa, Tonga, New Zealand). Current plan's to resume serious cruising, sometime in the next 3-5 weeks. Most likely to Fiji, New Caledonia, Vanuatu then Australia (~4,000 miles). We plan to sell our boat in Australia and return to work - somewhere.